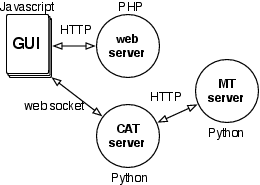 The code is organized in a modular fashion, consisting of the GUI running in the browser, the web server backend connected to a database, the CAT server, and the MT server, talking to a Moses server. Each of these components may run on a different machine. 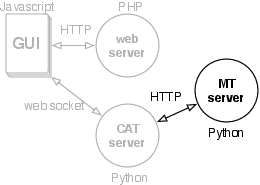 The MT server handles requests to translate sentences, and provides additional information such as lists of translation options or the search graph. It also provides component functionality such as tokenization and word alignment. other functions: word alignment, incremental updating, etc. 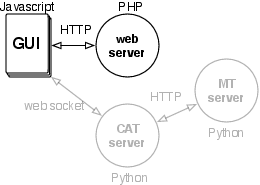 The implementation is in the script server.py. 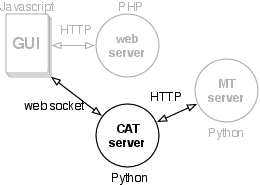 The Home Edition is a standard installation of all CASMACAT tools and dependencies in fixed file locations. It also features an administrative interface that allows the training of engines and configuration of the workbench. Machine translation engines within the Home Edition are packaged up in a directory that contains all model files and a command to start up the engine. This directory can also be packaged up and shared between users of the CASMACAT Home Edition.